Acknowledged author J. David Bergeron wrote Emergency Care (13th Edition) (EMT) comprising 1328 pages back in 2015. Textbook and etextbook are published under ISBN 0134024559 and 9780134024554. 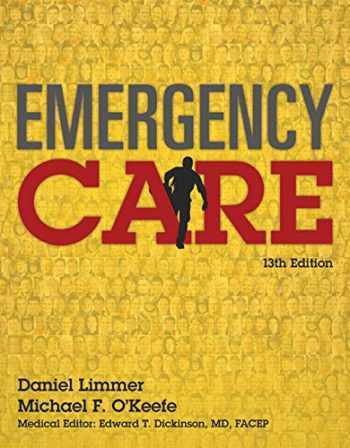 Since then Emergency Care (13th Edition) (EMT) textbook received total rating of 4 stars and was available to sell back to BooksRun online for the top buyback price of $46.51 or rent at the marketplace. For courses in Emergency Medical Technician Training and Emergency Medical Services Help students think like EMTs with the gold standard for EMT training For over 30 years, Emergency Care has provided generations of EMT students with the practical information they need to succeed in the classroom and in the field. Updated with the latest research and developments in emergency medical services, this edition meets the 2010 American Heart Association guidelines for CPR and ECC. Using the National EMS Education Standards as a foundation, Emergency Care goes beyond the Standards to provide the most current, accurate reflection of EMS practice today. The text integrates scientific principles in an easy-to-understand way, with a host of critical-thinking features that help students learn to think like EMTs. Also available with MyBRADYLab™ This title is also available with MyBRADYLab–an online homework, tutorial, and assessment program designed to work with this text to engage students and improve results. Within its structured environment, students practice what they learn, test their understanding, and pursue a personalized study plan that helps them better absorb course material and understand difficult concepts. NOTE: You are purchasing a standalone product; MyBRADYLab does not come packaged with this content. If you would like to purchase both the physical text and MyBRADYLab, search for ISBN: 0134190750/9780134190754 Emergency Care plus MyBRADYLab with Pearson eText -- Access Card -- for Emergency Care That package includes: 0133946096 / 9780133946093 MyBRADYLab with Pearson eText -- Access Card -- for Emergency Care 0134024559 / 9780134024554 Emergency Care MyBRADYLab should only be purchased when required by an instructor.